This is a little article on how to deal with timezones when storing dates/times in your database. The database or language you choose to use really doesn’t matter as the concepts are universal but I will be giving examples using MySQL and PHP. Timezones are actually a very trivial concept but they seem to be overlooked and over complicated. Typically when you setup a database or are using some web hosting service there will be some default timezones set. This default is okay if you have one server, but what happens if you decided to move your server or have multiple servers in different locations? Rather than storing a timezone with each date it’s better to just accept a standard time to store all your dates with, thus doing the conversion to that standard time before storing the value in the database. It doesn’t really matter what time we store it as, but it’s generally a good idea to just use UTC+00:00. UTC stands for "Universal Time, Coordinated" and is the successor to Greenwich Mean Time (GMT). They are almost synonymous with each other but UTC is considered the accepted standard. 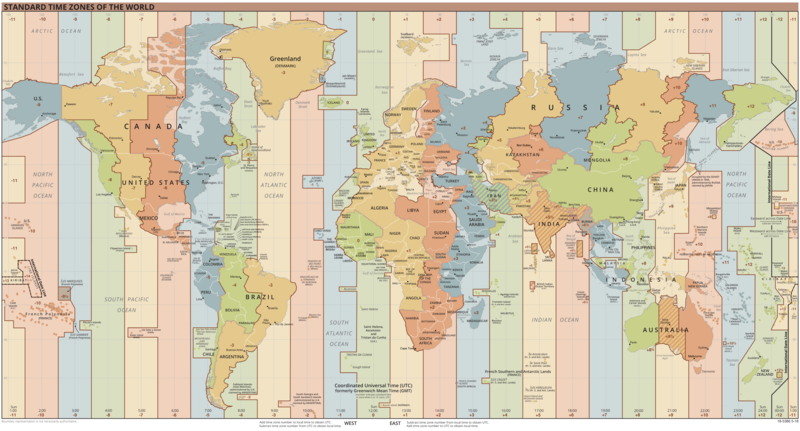 Basically, UTC is just a division of time with 40 distinct time zones. It has a 00:00 point with plus and minus 12 major timezones and also some additional half timezones like UTC+04:30. The idea is that if you have a timezone of UTC-05:00 then you would have to subtract -5 hours from the UTC+00:00 time to get to that time. Meaning if it’s 14:00 (or 2pm) in your timezone at UTC-05:00 (representing EST or Eastern timezone) then UTC+00:00 would be 19:00 (or 7pm). The first thing we would need to do is decide what timezone to store all our times in. I highly recommend using UTC+00:00 as your base timezone for no particular reason other than it’s easy to remember and 0 just represents a nice starting point. Once we know all the times are in UTC+00:00 then it becomes much easier to represent the proper time for each user based on their own personal timezone. Once a user has selected (or we have auto-detected) their timezone, then displaying the proper times for that user becomes trivial. We can put this in some kind of init at the beginning of our code and we’re done, all times will be displayed properly for that users timezone now. Setting the dates directly as we did above is useful if we don’t have access to change the MySQL configuration parameters. However, if we want to use things like TIMESTAMP which will typically update themselves or MySQL date functions like NOW(), then we would have to set MySQL to use UTC as a default timezone as well. There is a good chance that if you decided to standardize your timezones using UTC with a default UTC+00:00 offset that now your existing times in your database will be off. Thankfully MySQL provides a handy function to let us easily update our existing timezones. NOTE: If you have any timestamps that auto update, you will want to do them first. Where -05:00 would be the current timezone that the time is currently stored as, which in the above case would be Eastern. The +00:00 is the timezone we want to convert it to which in this case is UTC.